Paper to make some beautiful cards. ... to all your Creations. 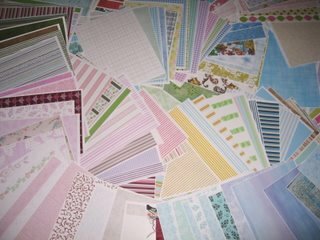 Paper is an essential cardmaking material, if you want to produce cards in varying colours and patterns. This material, for your cardmaking needs, comes in an array of colors, textures, finishes, and sizes. And all can make your card really special. There are some very beautiful ones... with quite expensive price tags to them. They come with foiling in the designs, or with the ever trendy distressed look. Experiment with mixing and matching patterns and colors, and don't worry about bright colours. As long as the colors are interesting then anything goes. Try spots, swirls, stripes, stars and lovely flower designs. Get your imagination working and see what you can come up with. Take a look at the colour wheel to help you in the planning of your colours. And Mother Nature has some wonderful combinations that you can try. There are matt, pearly, glossy, vellums, parchment, some have an added sparkle to them, and a host more and all give a completely different look. Store them flat, and in a box if you can. But remember the more you buy the more you will have to store. And after a while they get grubby and dog-eared, or even just out of date. And then you'll wish you hadn't bought so much. Some of the larger sizes are suitable if you want to make your own Envelopes. For fresh stock whenever you need it, then why not consider Digital downloads that you can buy off the internet and store on you PC. They can then be printed, whatever time of the day or night you may want to craft, and used as you need them. And if you have the free software from Picasa you will have much more choice at your fingertips.